This July sees the next biannual conference on Sports Engineering, held at the University of Massachusetts, Lowell. The conference always has a lot of interesting papers on the subject of engineering and technology in sport. Thanks to the internet age, the papers at this conference are also available online for anyone to read. Before the conference even began, one of the papers caused quite a stir, with several online blogs and news sites reporting on the findings. The paper is by our own Dr David James and Dr John Hart (in Collaboration with Danielle Macdonald) and investigates the effect of humidity on cricket ball swing. Dr James studied cricket ball dynamics for his PhD and he continues to research into the behaviour of the ball and various factors which have an effect. Dr James et al.’s paper looks specifically at humidity and its effect on cricket ball swing. Swing bowling is utilised in cricket to cause the ball to swerve on its way to the batter and make it more difficult to hit. Cricket folklore states that the ball will swing more on cloudy, humid days. However, the aerodynamic theory which explains why a cricket ball swings states that the lower density air at high humidity should create less ball swing. The team also looked at how high humidity affects the cricket ball (changes in shape and mass) to see if this could provide an explanation for the perceived increase in spin. They found no evidence to suggest a cause. So this paper suggests that the increase in swing on humid days is in fact a myth, there is no effect, or that there is an entirely different mechanism responsible. 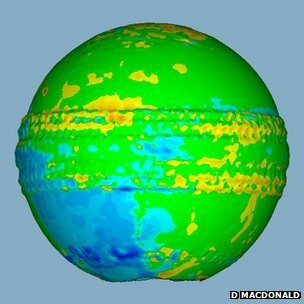 A laser scan of a cricket ball looking at changes in dimension which might be responsible for increased swing. ← Sports technology, enabling, enhancing or cheating?